Improve the security of your drivers and passengers. Capture and push video clips via cellular to the G4 Enterprise server and automatically send e-mails or text messages to notify selected individuals of the emergency. Police can be included on the e-mail list if required. Activation is via a button mounted on the dash or a switch mounted in the driver’s foot well. The dash mounted button comes with a cover that must be flipped up in order to activate the switch. The cover prevents inadvertent button presses. The foot-well switch is mounted so that it can be covertly activated. When a driver presses the emergency alert switch, a video clip from selected cameras is automatically sent to the G4 Enterprise server via cellular. The DVR and selected cameras is configured with pre-defined settings of pre and post video at the time the switch is pushed. You suspect that something is not right with the activities on a particular route. Maybe the driver stops for coffee or there are some concerning reports about the driver’s behavior. Gatekeeper wireless system allows you to predefine a scheduled download. A specific vehicle, a time range and the days the downloads are to occur can all be preset. When the vehicle returns to the yard the predefined video will be automatically downloaded to the G4 Enterprise server via WiFi. Downloads can be scheduled without any configuration at the DVR. Proactively monitors the health status of your wireless DVRs and cameras on each vehicle. Easily locate and quickly solve intermittent equipment problems. Reports and alerts sent via e-mail or text messages available. DVR recording equipment will report via cellular or WiFi connection it’s health back to the health check server daily. Now fleet managers will know if there is camera that needs replacing or if the DVR has an issue with its GPS. In addition to daily information about the health, historical issues are also tracked. This allows for the tracking of equipment that may have been moved from vehicle to vehicle. With System Health Check Reporting, the probability of not having the crucial video you need is greatly reduced. Based on pre-defined events, such as excessive speeding, panic button, accelerometer, and other threshold values, etc. video can be automatically pushed from a cellular equipped mobile DVR to the G4 Enterprise server. Along with the event notification, video from before and after the event is also sent to the G4 Enterprise server. When received, the server can be configured to send either an e-mail message or a text message to selected personnel. This feature allows a high G force event to be tracked through a G Force sensor which is available with all of Gatekeeper DVR’s. It can be configured to report on hard cornering, hard braking or a high G collision. Now a fleet manager has video of the incident to help determine the cause of the excessive G event. Vehicles can be tracked in real time on a map. Utilizing cellular data connection, the DVR can be configured to send its position back to the G4 Enterprise server. Using G4 Viewer+ connected to the Enterprise Server, Google maps will display the location of the vehicles. By double clicking on the vehicle one can then see live streaming video from the vehicle. It 6 PM and the vehicles have returned from their scheduled run. They have been powered down for 45 minutes. A incident has been report and requires investigation. You could run out to the yard 10 miles away and retrieve the the hard drive. With Gatekeeper’s AUTOWAKE System the DVR and WiFi radio can be powered on/off by using a PC in the comfort of your office. With the DVR equipment powered on, the video analyst can utilize a WiFi connection to search the hard drive in the vehicle for the reported incident and download the video and all meta-data. 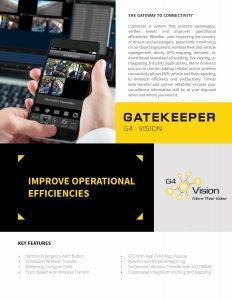 Gatekeeper Systems offer a service to design and implement a gateway between wirelessly connected DVR’s and third-party applications. Realize your gateway to connectivity with G4 Vision – More Than Video.